Vox, the rightwing, anti-immigration party that was the clear winner of the regional election in Andalucia, shocked the conservative Spanish media when their lead candidate for the region, Mr Francisco Serrano, claimed that his party’s rise would be nothing short of the start of “la Reconquista,” the term used to describe the Christian conquest of the Muslim kingdoms in the Iberian peninsula. The Reconquista marks a period in European history when the Spanish kings of the Iberian Peninsula started to battle the Moors (Muslims) and took back the land. It ended when they took back the Emirate of Granada, the last Muslim state in the peninsula, in 1491. After this, Columbus got royal support for his transatlantic voyage, discovered America, and thanks to the imported riches, Spain ruled the world for a century after that. Related coverage: Spain - Nationalists ‘Vox’ Amazing Win In Andalucia Elections, Enter New Parliament. The anti-Muslim rhetoric was something not heard of openly in Spain for decades and is something new for the other political parties. 📣🇪🇸 La #EspañaViva ha hecho historia. 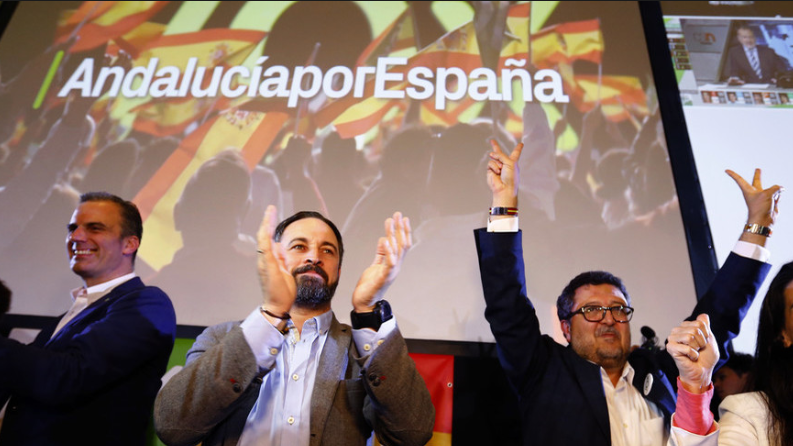 But given the major difference between Vox’s polling numbers (they were at 3 to 5 % in the polls) and ended up taking 11%, it is clear that the next regional elections in Spain, planned for the first months of 2019, are not something the leftwing minority government of Prime Minister Pedro Sanchez are thrilled about. The other conservative parties in Spain, the PP (Partido Popular) and Ciudadanos have now called upon the government to organize national elections, given the lefwing socialists poor showing. Seeing national polls which promise him nothing well, Prime Minister Sanchez has refused to organize these so far. “The loss in Andalucia is the loss of Pedro Sánchez,” José Manuel Villegas, the Ciudadanos general secretary, said. We need Franco to return. Viva la Morte! Except in Texas it has the unfortunate connotation of the Mexicans crawling up from Mexico and outfucking us.